Australian scientists have uncovered part of the process that leads to ‘inflammatory flares’ in patients with a rare immune disorder. Garvan researchers have developed a method for detecting the products of ‘fusion’ genes in cancer cells more accurately than current clinical methods. Dr Thomas Cox and Professor Chris Ormandy have been awarded three-year Project Grants from Cancer Council NSW to explore innovative research projects in pancreatic and breast cancer respectively. By fine-tuning how algorithms carve up DNA data, Garvan researchers have made it possible to do genomic analysis on a smartphone. The ‘mistakes’ in cancer DNA may be linked to not only how – but when – DNA is copied when cells divide. Thanks to the Garvan-led research program CIRCA, patients living with critical, rare immune conditions are receiving life-saving treatment. A new research project will allow patients and researchers to ‘see’ the drivers of cancer in virtual reality. A close-up view of the two meters of DNA inside prostate cancer cells has uncovered new clues about how normal cells turn cancerous. Six new Cancer Institute NSW Fellowships have been awarded to Garvan researchers to support various projects into innovative cancer treatment research. Dr Venessa Chin is using cellular genomics, or single cell sequencing, to better determine which lung cancer patients will respond best to immunotherapy. The key to better tuberculosis prevention – and to improving the odds for millions of patients globally – could lie in simply boosting the body’s natural levels of a small molecule. With the holiday season right around the corner, most of us will be looking forward to coming together with family and friends to celebrate. Announced today, Garvan researchers have received a total of $6.6 million in Project Grants from the National Health and Medical Research Council (NHMRC). Dr Robert Weatheritt, head of the Neurotranscriptomics laboratory at the Garvan Institute and EMBL Australia Group Leader is unravelling the complexity of the human brain and uncovering what happens when it goes wrong. Type 1 diabetes, multiple sclerosis, lupus, rheumatoid arthritis... all caused by the same disease process – autoimmunity. 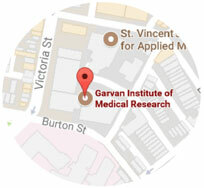 Garvan’s revolutionary Hope Research project is looking for the root cause. If Ellie had been diagnosed two years earlier, she would have died. But the Zero Childhood Cancer trial and generous Lions support mean Ellie’s story has a happy ending.